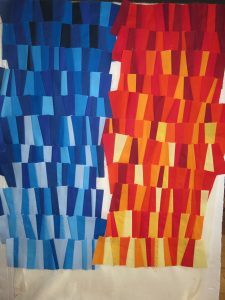 Improv quilting is often associated with modern quilting and frequently seems to include use of bold, solid colours and graphic lines with lots of negative space. There is a long history of improv quilting. 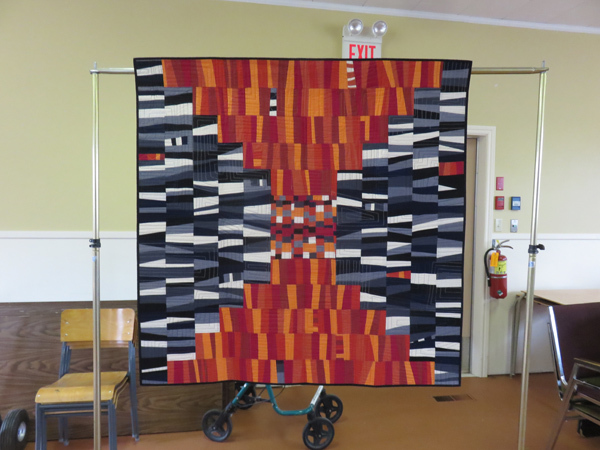 Modern quilt movements have been influenced by work of quilters from Gee’s Bend, a small, remote, African-American community in Alabama. The quilters from this isolated community are known for bright colours and improvisational approaches. A Google search will quickly show lots of examples of Gee’s Bend quilts since the 1920s. Here is one place to read about the Gee’s Bend quilters. Not all people define improvisational quilting by solid colours and bold pieces though. By contrast, many people seem to associate it with scrappy quilts with lots of colours, patterns and often very small pieces. In the absence of a common definition, I have started thinking of it simply as working without a fixed pattern or even a cut list. This freedom appeals to me and I find that I love to mix it with some guidelines to have a combination of a designed element with more flexible pieces. Traditional patterns and piecing don’t hold much appeal for me. I prefer to have at least some of my own design so I incorporate some improvisation before I start or as I go. I have been exploring some improve techniques to varying degrees in the past month. I am going to share three examples that I would refer to as improv. For the first example, I made a block outline but no piece details. A friend asked me to make a quilt for a baby boy so I set a final size (40” x 40”) and possible block sizes then went to my stash. I had several Dr. Seuss materials of various sizes that I thought would be fun for this project then pieced them together and cut them to fit the different block dimensions. When I finished the pieces, I played with them on my design wall. 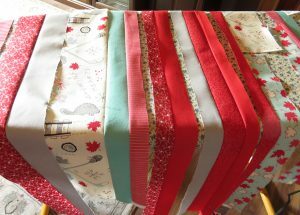 These fabrics were great for this type of free design since they all can be used in any direction. For the four large blocks in the bottom of the original sketch corner, I ended up choosing to do a disappearing nine-patch, cutting a nine-patch block into four units and rotating. 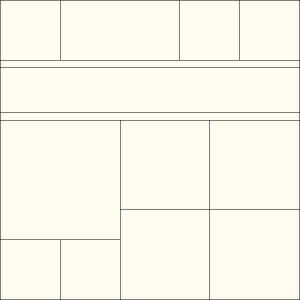 The general pattern that I made for my quilt in EQ7 – I added sizes for the full quilt and large blocks. The finished quilt. I pieced scraps to fit the full block size then played with them on design wall. In the second example, I had some required parameters that had to be met. 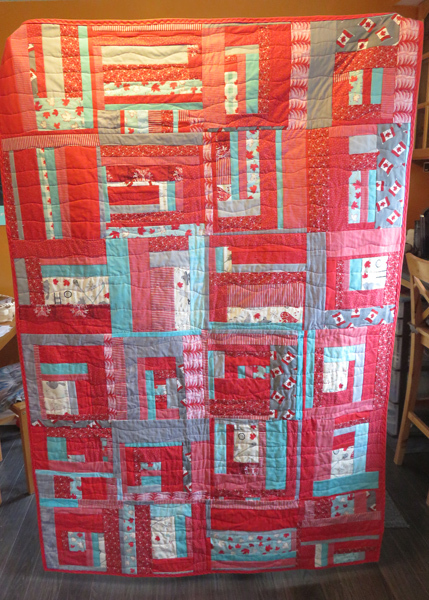 I made a project for the Canadian Quilters’ Association . 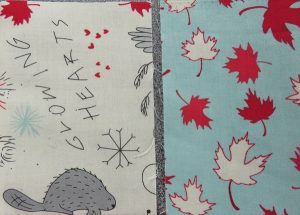 Quilters from across Canada are making blocks, quilt tops or full quilts as part of the Canada 150 Big Quilt Bee celebration. 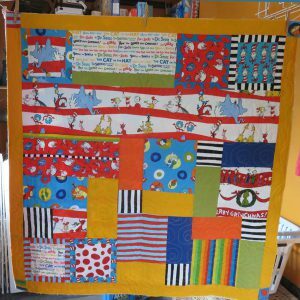 The goal is 1000 completed quilts for donation to every Ronald MacDonald House in Canada. My guild – Mahone Bay Quilters Guild – is participating. I decided to make a full quilt. 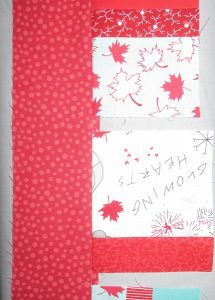 The guidelines recommend slab blocks and state that each block has to include at least one piece of special Canada 150 fabric and has to finish at 12”. The finished quilt is to be either 12 or 24 blocks. Other than that, it is flexible. Many of the blocks and tops were scrappy but I decided to build mine around the colours in these 2 strips that I got from the guild. They are from the Trend-Tex With Glowing Hearts 150 Collection. I checked my stash and bought a couple of meters of base colours to carry through that whole project. I cut the materials in strips of various widths and started building around the blocks. My finished quilt (48″ x 72″). I did a gentle curve quilting pattern horizontally to add some balance against all the squares and rectangles. Chess on the Courthouse Steps, by Krista Hennebury, uses improv strips with traditional piecing. 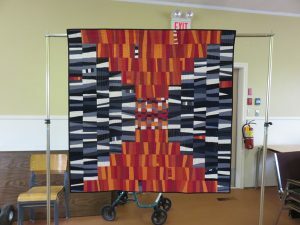 Krista teaches ways to introduce modern touches with traditional piecing to create a unique quilt using bold plain colours. 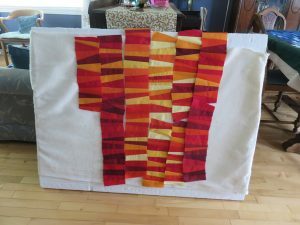 She shared her unique method for cutting 5”squares and piecing them into strips then turning the strips into a one-of-a-kind design. I learned some new approaches that I will definitely be using in other projects. I have a couple of ideas of how I want to put it together but I am not finished playing with this yet In fact, I have gone in an entirely different direction than originally planned. Stay tuned to see more soon. You can build a whole quilt with an improv approach or just a piece of a more structured whole. If you want to just dip a toe in the waters, you might start with a randomly pieced back or one scrappy corner block on a traditional pieced quilt. I’d love to see what you are doing with improv design. Please share your pictures in comments or on Facebook.